Made of 100% GOTS certified organic Egyptian cotton, these super soft rib knit long johns also have the required close-fit silhouette that complies with Federal Safety Standards for children's sleepwear. They are made without the use of toxic flame retardant chemicals, and are safe for your little ones. 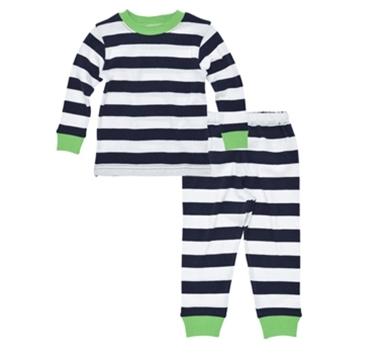 Striped baby pajamas feature a pull over top and elastic waist pant. Under the Nile offers an alternative to conventional cotton apparel for infants and children. All striped baby pajamas are made from 100% handpicked organic cotton, without the use of pesticides or chemicals throughout the entire production process. Grown exclusively in Egypt, these organic baby long johns reflect the extremely soft and durable features that Egyptian cotton is known for. Under the Nile's dyeing process uses metal-free or vegetable dyes. Accessories such as buttons and zippers are made from organically friendly elements such as wood, shell or nickel-free metals. The line is EDI compatible.